The History of Redding web site is not a business or non-profit organization...It's one person working to promote the history of his hometown and surrounding areas. All costs are out-of-pocket so donations and/or sponsorships will allow me to dedicate more time and effort to research and updates. 4. In addition, I advise you on what people are looking for in the area and what is working or is not working in the local area, marketing wise. 5. The cost? $200 a month, no contracts, no hassles...just a spike in traffic to your website, store, restaurant, business or event. Don't have a website? I'll design one for you, at no cost, your sponsorship covers it. Call me at 860-364-7475 or e-mail me at bcolley@snet.net and I'll put you in touch with people who have used my services. Here is what to consider when measuring the costs of print ads vs. online campaigns. When you run a print ad you "hope" people see it, when you run an ad on History of Redding we'll make sure people see it! This site had 480,000+ page views in 2009.
the possibilities are plentiful and affordable. Search Engines are used daily to find products and services. 70% of Americans consult the web before making local buying decisions. History of Redding ranks highly for most terms relating to the local area. When you purchase a print ad you don't have too many options in terms of placement. When you advertise with the History of Redding you can have an ad anywhere you want it for as long as you want it there. And I'll send you weekly reports showing you your traffic at the site. Print ads are visible for a day or so before they end up in the trash. An online ad stays online until you take it down and continues to promote your business 24/7. 1. Unlike print ads, online ads do not get thrown away. When you run a print ad there is a very short window of opportunity to capture potential buyers attention. This is not the case online, when you advertise on HistoryofRedding.com your ad and/or company profile remains online until you ask to have it removed. In addition to posting your ad, company profile, article about you and your business, etc...we monitor page views for you and work to position your information in areas that will give you the most exposure...something you can't do in print. You can run as many ads as you'd like for $200 a month here. 2. Search Engines find new web sites via web links. If you do a couple searches on Redding, Georgetown, and Branchville related terms you will find the HistoryofRedding.com listed. I do not pay to be ranked this high, I work at it, adding new content weekly and researching topics people are interested in locally. Because I add new content so often, the search engines visit often to see what I have added. What does that mean to you? It means that if I run an article about your company and link to your website, the next time the search engines visit my sites they will find a link to your site which in turn will lead to more traffic. 3. Local Search is Gaining Momentum. "Local search is fast becoming the most exciting search vertical on the web. Recent research by the Kelsey Group reported that 70% of Americans consult the web before making local buying decisions. 54% of search users have substituted Internet/Search for the phone book. People no longer search with generic terms, they use specific terms to find specific things in specific locations. If you want a Barber in Branchville, CT, you would search for "Barber+Branchville, CT" not just "Barber". This is what they mean by "local search". This is a topic I've been well aware of for years and a topic I can assist you and your company with. A sponsorship with HistoryofRedding.com can greatly improve your local search results. 4. I Monitor the "pulse" of the Area. I keep an eye on local news & events to keep up on local topics of interest and use a number of tools and services to monitor what people are searching on relating to the local area. Once you are a site sponsor I work for you on multi-levels and this is one of them...placing your information where people are viewing content and creating content people are interested in. The site focuses on the past and present times of Redding, Georgetown, and Branchville. "Wanted to thank you for an excellent blog post! We are getting a lot of calls FINALLY YAY! Thanks to you we're alive again!!! " "Just landed a new client off the website posting...this is the quickest ROI I've ever had. Thank you!" Ad Campaigns are easy here at the History of Redding: The cost? $200 a month, no contracts, no hassles...just a spike in traffic to your website, store, restaurant, business or event. Don't have a website? I'll design one for you, at no cost, your sponsorship covers it. Ad space is available in text, banner ads, full page spreads or all of the above. We do not confuse you with terms like: "cost-per-click" or "page impressions" we simply run your ads all over the site, coming up with unique ideas to promote your business. Proceeds from ad sales go directly towards the service fees, maintenance and expansion of this site...we have no rent or administrative costs. Our page views increase every month! Please contact me at bcolley@colleyweb.com with inquires or call 860-364-7475. Cloverdale Inc. is an environmental company that markets biodegradable cleaning products, including an all-purpose cleaner that is U.S.D.A. approved and meets OSHA requirements, a dishwashing liquid and laundry soap. Our products have household uses are also excellent in commercial and industrial applications. Greenpeace has tested Cloverdale; the White House is considering it for use in the Greening of the White House; Mario Andretti offered to be the spokesperson after Cloverdale products were highly praised by Paul Newman; Robert Redfords Sundance catalog carried our products; the Presidental Yacht SEQUOIA used Cloverdale as a bilge wash, boat cleaner. Cloverdale cleaner has also been listed in numerous environmental journals and green guides. Ancona's Market in Branchville, CT sells Cloverdale! The uses of Cloverdale are endless. The product is a water based surfactant that is petroleum free. It contains quaternary ammonium compound derived from coconuts which is the disinfectant. How one uses Cloverdale depends on the job at hand. For Example: last year when we power washed our house we used Cloverdale instead of bleach and we did not need to cover any plants or bushes and we didn't lose any plants or bushes. 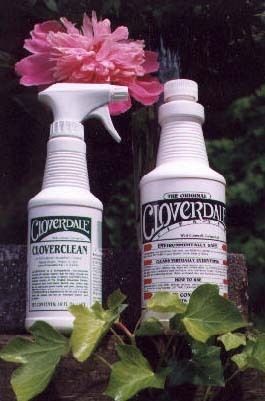 The Original Cloverdale Cleaner is a concentrate that is diluted with water. For instance, 8 parts water to 1 part concentrate is the all-purpose solution. Cloverclean is our ready-to-use spray bottle with a concentrate line on it for remixing using the concentrate and adding water. One quart of concentrate will make 16 or more pint spray bottles. Very cost effective for use in the kitchen,bathroom, workshop,indoors or outdoors. Cloverdish is a hand washing dish liquid that is safe for sensitive hands and excellent for washing fine washables, especially sweaters. Cloverwash is a citrus based laundry soap that is safe for your septic system as are all of our products. Retailers who are interested in learning more about our company and its products are urged to contact us by Fax, Phone,Snail mail or Email. CLOVERDALE is truly one of the SECRETS of New England.